We are now getting ready to start week 2 of my spring cleaning challenge. I hope that even if you aren’t following along with the challenge that it has at least inspired you to start doing some spring cleaning in some areas of your life. I had great success when cleaning my kitchen and it feels great to have that area of my home clean. Now week 2 I’m taking on the challenge of my living room and dining area.You can check out my week 1 reveal and add your own posts. We also have a desk in this area but I’m not working on the desk at all this week. My desk and all paperwork will be done during week 6. As you’ll see from the following photos I am dealing with a very cluttered home and a lot of messes. I hate showing that but I want to be open with you all and show that I’m in need of this cleaning challenge as much as any one. I’m working hard to get my home where I want it to be and what I want it to look like. This is the space where I do the majority of my blogging. On the couch in the living room. The table next to me is usually cluttered with all sorts of things. Just one of the many units that we have with bins full of stuff. We have two white ones and one black, So we have a lot of stuff. The white cabinet holds shoes so that the puppy can’t get them. The rainbow drawers holds some of my daughters art supplies. Here is a look at my dining room table. It’s such a mess and is right next to the desk that my husband uses. Our vacuum broke this week that’s why it’s in the box to be thrown away. I’m excited to use the new one we just ordered. Step 1: Purge: This is going to be huge in these spaces. I have a ton of bin full of who knows what that I need to go to. Also our dining room table becomes a dumping ground and I need to go through everything. Step 2: Tidy: I need to organize those bins so that I know where everything is located. Step 3: Clean: I want to do a really thorough job vacuuming, including baseboards and corners. Also go through and dust surfaces and knick knacks. Step 4: Projects: I want to get curtains put up, fix that light in the dining room or take it down, move the bookshelf to where the dining room table is and reverse. I’d really love to paint and although I don’t think that will be happening this week I’m going to try to at least get a color chosen. I’m excited to get in here and get started with this mess and clutter. Taking rooms one at a time. Helps me to not feel too overwhelmed by trying to do the whole house all at once. Then it gives me enough time off to not feel stressed out and burned out by doing too much. So lets start doing the second week of the cleaning challenge. I love the pictures and the step by step guide to get your place clean for spring. Thank you for the inspiration. I need to get my house in order!!! I love purging stuff! It feels so much better when you get rid of things! This post reminds me that I need to do that this week also. Thanks for posting! looks like a good plan for the week and i’m sure doing it room by room makes it a lot easier! good luck! 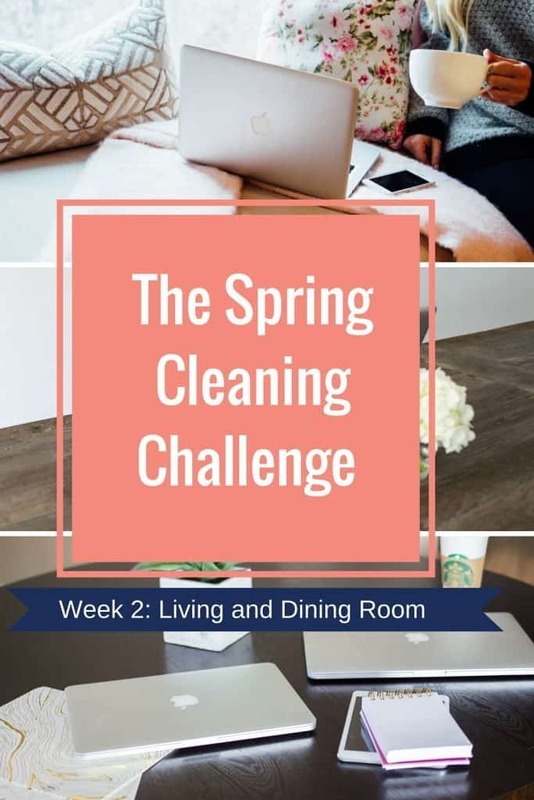 I desperately need help when it comes to spring cleaning – thank you for sharing your challenge! I really need to go back to your week one and follow through with my own house. This is so great. Thanks for sharing. I love/hate spring cleaning. Mostly I love the end result, but it’s so hard for me to get going!